To help data science candidates make the right decisions about their career, the Paysa team has pulled together some information on where data scientists earn the most—including top companies and cities—along with additional hiring trends and more. 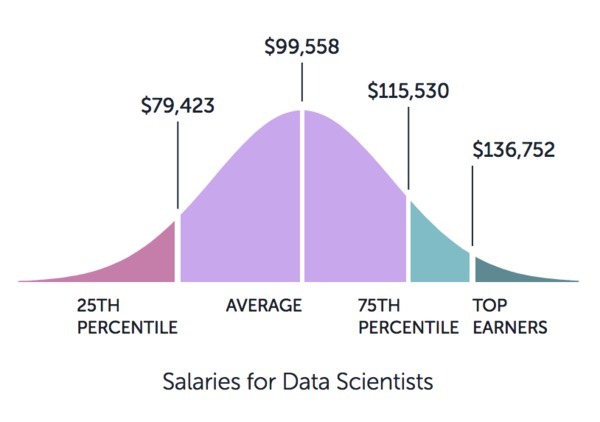 Data scientist salaries average out to $99,558, ranging from $79,423 at the 25th percentile to $115,530 at the 75th percentile, with top earners (the top 10%) earning more than $136,752. Click here for the most up-to-date salary information. These are the five best-paying cities for data scientists. Here are the top schools where data scientists attend. And the top degrees for data scientists, too. These are top technical skills data scientists should know. There are plenty of open opportunities out there for data scientists. Visit Paysa to learn more about Job Sense—our new tool for helping match you with the best data scientist opportunities.